Computer is an integral part of our lives today. From banking and teaching to medicine and shopping, there is hardly any aspect of modern day existence is not affected by computer. Computer Science is considered as a highly viable and lucrative career choice. Computer Science is a vast subject which takes you in the fascinating world of computers, their design,data processing, development of computer hardware and many other facets of technology. Carnegie Mellon University– The school of Computer Science at Carnegie Mellon University offers one of the most coveted MS in Computer Science in USA for Indian students. The course module covers various areas such as Statistics, Graphical modules, Languages, Programming etc. Stanford University– Established in 1965, the Stanford computer department has contributed tomany amazing changes in the field of modern computer science. Masters in Computer Science from Stanford University is a much sought after degree. Massachusetts Institute of Technology– The department of Computer Science at the MIT requires the students to do 66 course units and covers various aspects of CS. University of California Berkeley– The Department of Computer Science at the University of California, Berkeley offers two graduate programs in Computer Science, Mater of MS in USA and Doctor of Philosophy. They help in laying the groundwork for pursuing a PHD or making a career is academics or industry. Cornell University–The Computer Science program at the Cornell University incorporates both the technical and business classes and focuses on entrepreneurial skills. Harvard University– The Computer Science course at the world renowned Harvard University gives you a deep understanding of cloud computing, privacy, scalability, security and software technologies. University of Illinois–Pursuing a MS in Computer Science in USA at the University of Illinois helps the student to learn fundamental concepts of computer science and programming. Also the students are taught how the past and present technologies affect the future innovations. Princeton University– The program at the Princeton University is designed for current and future managers and founders, who are looking to master the ability to make better technology decisions. University of Texas, Austin –The MS in Computer Science in USA at the University of Texas encompasses theory, mathematical activities such as design and analysis of algorithms that create and describe information and formulate suitable abstractions to model complex systems. Georgia Institute of Technology–The course at the Georgia Institute of Technology stressed onhands on approach, applying computer science theory to business and other world problems through examination and manipulation of large databases. Future belongs to those who dare to dream. With career options galore, MS in USA is an ideal choice in today’s digital economy. 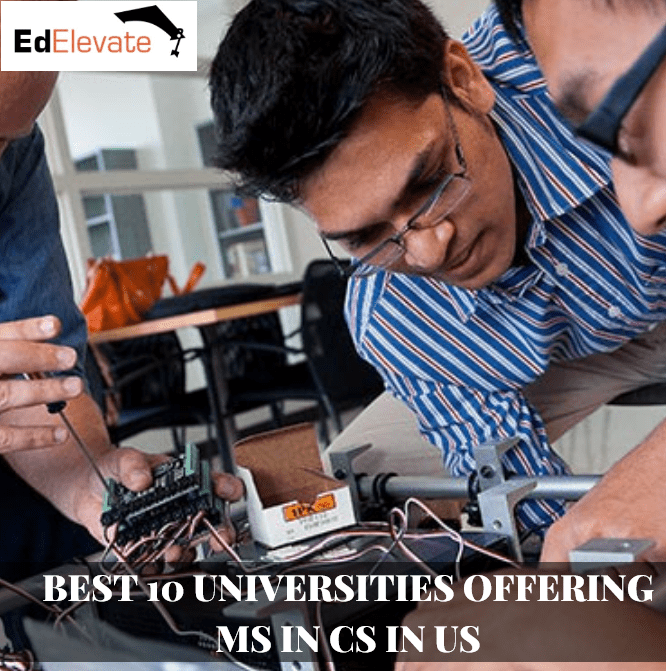 If you wish to know more about how to get admission for a MS in Computer Science at the best University in US, come to the best MS admission consultant -Edelevate.